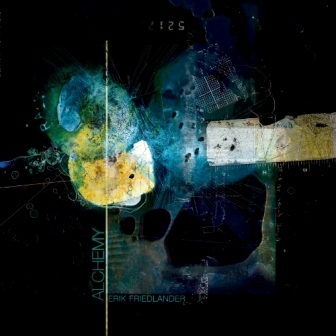 No doubt one of the most prominent cello-players in modern jazz, and an essential part of the overall sound of John Zorn's musical universe, Erik Friedlander has turned fifty, and for the occasion he brings us two albums. He has been searching for his own voice as a musician, hesitating between the jazzy "Broken Arm Trio", the more ambitious "classical" sound of "Grains Of Paradise", or the more modern studio work like "Block Ice & Propane", or avant-garde work as with Dani or Teardo. His work with the Masada String Trio is possibly the easiest to recommend. Fifty short pieces of music are clustered in seven groups of seven pieces, plus one at the end to round it off. The structure is inspired by the "50 Gates Of Understanding": 49 days of self-evaluation and character development undertaken by Moses and the Israelites during the Exodus. After seven weeks, they were ready to receive the covenant, the "10 Commandments", on the 50th day. Apart from this being mentioned in the liner notes, I am not sure how this information is relevant for the music. Sure, there are the obligatory klezmer influences, but the overall sound does not sound religious at all. And that's probably a good thing. The band is Jennifer Choi on violin, Erik Friedlander on cello, Sylvie Courvoisier on piano, Trevor Dunn on bass, and Mike Sarin on percussion. Despite the incredible short length of the pieces, the overall result is quite coherent, with sometimes sudden unexpected violent intrusion in more sensitive pieces, but the contrast works well. Not only is the playing excellent, but Friedlander is full of musical ideas, sufficiently so to make the short snippets of music - sometimes quite structured, sometimes seemingly improvised - utterly compelling. The only downside of the approach is the total impossibility to expand on any given idea, somehow crucial to jazz, reducing the identification of the listener with the music, or to say it differently, not long enough to allow the listener to become truly part of the music. Each time you start to be in the tune, it's already gone, evaporated, sucked up by the past. And that effect is possibly what it may feel like to become fifty: time flows by, ungraspable, and it's gone before you know it. Originally only released on vinyl, this album brings a collection of moody and sad pieces, primarily played by Friedlander on cello with overdubs, and with Teho Teardo on keyboards and guitar on "The Wrong Answers".The music is almost like a soundtrack, full of direct emotions and easy to remember themes, quite accessible and atmospheric. Friedlander's playing - on especially the opening track - is absolutely fabulous. Against the quiet and softly plucked backdrop, his arco will drag you from dark deep tones to heart-piercing and precise high tones, all in one natural and effortless movement. Several of the tracks are dedicated to or inspired by authors : Ken Follett, Robert Frost, Cormac McCarthy, John Berryman. Luckily it is not all misery and sadness, pieces like "Wag" often a fun change, "Lee Av" is a gospel tune, and because of its predictable harmonics somewhat less interesting, "Folly" is a short piece with eery electronics. 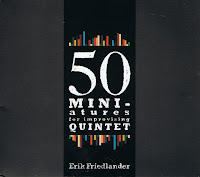 It is good, but not essential in Friedlander's discography. A digital single, released earlier this year, and freely downloadable from the artist's website, with Erik Friedlander, cello, electronics and piano programming, Michael Leonhart on trumpet and mellophone, Trevor Dunn on acoustic bass, and Satoshi Takeishi on percussion. Nice and sweet. Listen and/or download the track here. 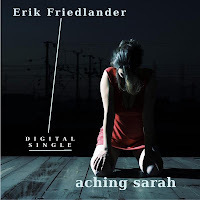 Listen and download all albums from Erik Friedlander's website. Once saw this guy perform a Zorn piece for solo cello at the Menil Collection in Houston. Incredible musician.